Racing Safety - Race Legends, Inc. The Basic Driver Capsule incorporates only the principal feature of the original, the hinged seat-back - the feature that reduces life-threatening accelerations more effectively than anything currently proposed. 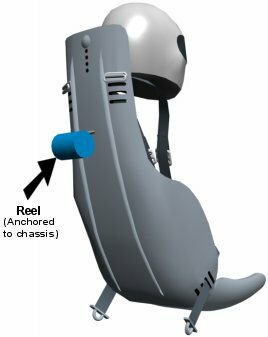 Reduced to essentials, the original metal hip hinge is replaced by a seat-back pivot integral with the lap belt and its anchor, as illustrated. 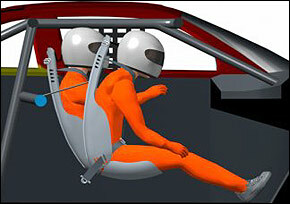 The seat-back pivots at the driver's hip. The lap belt threads through slots, thus the mechanical hinge of the original design is replaced by a second function of the lap belt in the Basic Driver Capsule. Multiple slots for the lap belt and the shoulder straps through the seat-back accomodate all drivers. Use of the belt in this manner may be controversial in view of the recent focus on belt efficiency related to its alignment. Any secondary use of belts must have the full approval of all parties. Without it, the use of the belts will revert to the original metal hinge. Copyright ©2016 by Race Safety, Inc. Portions copyright John Fitch. All Rights Reserved.